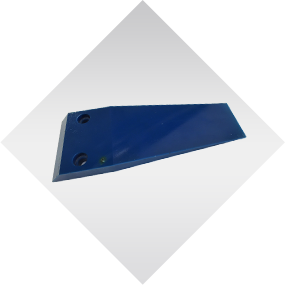 Polyurethane cutting edges can be applied as truck mounted plow blades, ATV, skid loaders, and bucket-mounted equipment. The polyurethane cutting edges help to protect hard and smooth surfaces such as pavements and cobblestone. More so they have more lifespan when compared to rubber cutting edges and helps to reduce the damage done to in-ground runway lights. Plan Tech manufactures rubber cutting edges which are suitable for use in snow removal companies, Airports, conveyor belts and state highway departments. Our cutting edges are carefully produced to last longer against abrasion and withstand freezing temperatures. Plan Tech manufactures polyurethane cutting edges of different sizes and we also produce custom made polyurethane cutting edges based on the specific needs of our client. Why choose Plan Tech Cutting Edges? Poly cutting edges are cost effective because they do not damage easily when compared to rubber cutting edges. High durometer cutting edges absorb impacts and easily blends to the surface being plowed rather than damaging it. Rubber cutting edges are suitable for use on concrete, brick, cobblestone, pavers, parking garages and other similar surfaces. Polyurethane edges are very quiet in operation, making them ideal for use in hospitals and residential areas. Are you interested in cast Polyurethane Cutting Edges? Please Contact us so we can help solve your requirements and work with you on your specific application!